SimplyCast provides interactive and multi-channel communication software for organizations worldwide. The company’s 360 Customer Flow Communication platform is a marketing software solution combining marketing automation, inbound marketing and interactive communication. With customers in over 175 countries SimplyCast provides organizations the ability to reach customers on their preferred mode of communication. This including many recognized brand names around the globe in retail, non-profit and hospitality industries, like MGM Resorts, SingTel, United Way, Rogers and Dunkin’ Donuts. SimplyCast began in 1999 as an e-marketing company with a focus on email automation and a vision to build an all-in-one marketing and communication solution. President and CEO Saeed El-Darahali helped grow the company to a comprehensive solution with worldwide clients. All tools have been built in-house from the ground up. Are you looking for an SimplyCast alternative for your email marketing? We listed some SimplyCast alternatives. SimplyCast provides marketing automation and communication tools to customers in many different industries around the world. 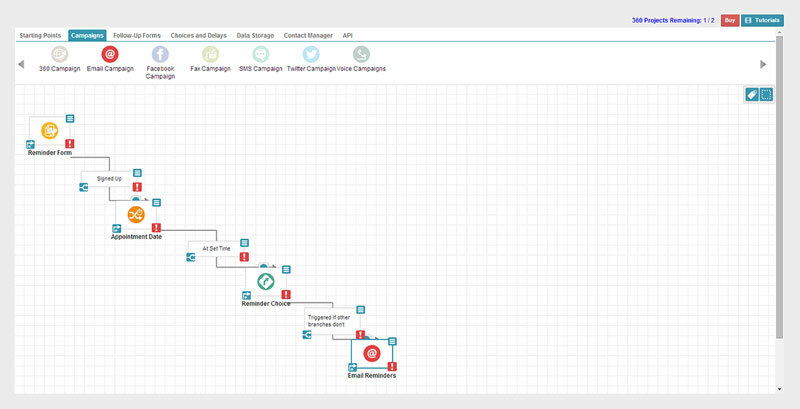 The 360 Customer Flow Communication platform enables businesses and organizations of all sizes to automatically send personally targeted campaigns to each of their unique contacts. The marketing suite of tools includes email marketing and autoresponder, a contact management, live chat, fax marketing, SMS marketing, voicemail, form builder, online survey, event management, Facebook and Twitter management, landing page generator, web tracking and blacklist monitor. SimplyCast 360 makes it easy to maintain meaningful contact with every one of your customers. It features a simple drag and drop interface. Reach customers over multiple channels, on their preferred channel of communication. Automatically cater to customers' individual needs, build loyalty and save time.